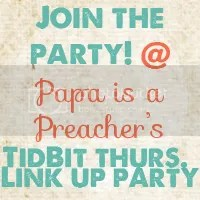 TidBit Thursday and Growing Pains. Yesterday was my first day at work. They were hiring folks on the spot next week and I began yesterday. It was a pleasant experience and I’m glad to be doing what I’m doing. 🙂 Today, however, is special because of a certain May baby. The baby of the house turns 12 and tonight the house will be filled with boys who will help us celebrate the Kid’s last birthday as a preteen. I know it’s his birthday and I don’t want to make it about me (but I’m about to do so anyways), yet I feel a mixture of sadness and so much joy. My little child is becoming a man. And next year he becomes a teenager! Worse than that, the same year he enters adolescence, I leave it. Forever. I’ll be 20 next year. I can’t really believe it though. It doesn’t sink in. How do I go about growing up? I’m really not sure. Can’t I just stay here in my room and be 15 for the next couple of years while I figure it out? 20? What does one do when one is 20? Pretty sure you’re supposed to have at least that figured out. Oh wells, today’s about the Kid who has all his life yet to live. Do you remember your 12th birthday? Previous Article Which Comes First? You are leaving your teens and your brother is entering them – a milestone for both of you. It is all bittersweet isn't it? Not sure why but my computer goes crazy when I come to your blog, lol. IT doesn't like to scroll up and down. Congrats on the birthdays, both the little ones and yours to come. So what is this link up thing?